Took a break from campaign work Friday night and checked out Amherst’s newest entertainment option. 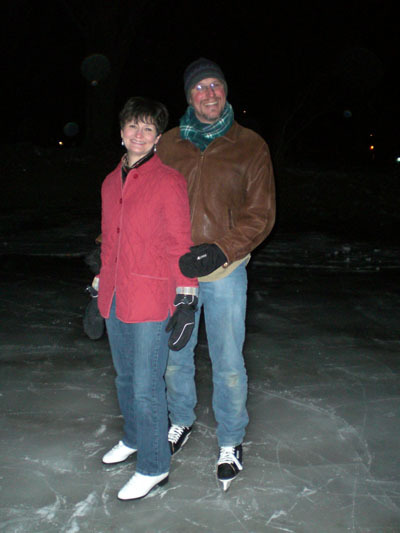 Met some friends for ice skating at the “rink” on Kendrick Park. I keep seeing DPW guys spraying it down with water in the mornings. The ice was quite good. A little bumpy – I guess the zamboni will have to wait for next year’s capital budget. Here’s Jonathan and me after we nailed our triple-lutz/double-axel combo. Or something like that. Warmed up afterwards with a nice dinner at Amherst Brewing Company. A great Friday night downtown.